Your sanctuary with everlasting joy" and beautiful decorations. and has commanded us to wrap ourselves in the Tzitzit". 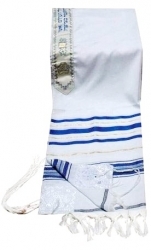 What is a Talit (Tallit)? It is a prayer shawl, the most authentic Jewish garment. It is a piece of linen or wool with special fringes on each of the four corners. Prayer Shawl - Burgundy & Gold - Large - 68" x 47"